Hey everyone, i am back with another review. Today I am here to review Neulii's BHA PHA 5.5 Peeling Pads from RoseRoseShop. If you have no idea about what BHA or PHA is then please visit my instagram post HERE, i have explained it briefly. 2) The cotton pads used to soak the essence are made up of 100% pure cotton. It does contain cotton powder as well but it doesn't affect the product in any way. The packaging of this product is very minimalistic. The outer packaging is made up of white cardboard and the product itself comes in a sturdy transparent plastic container. 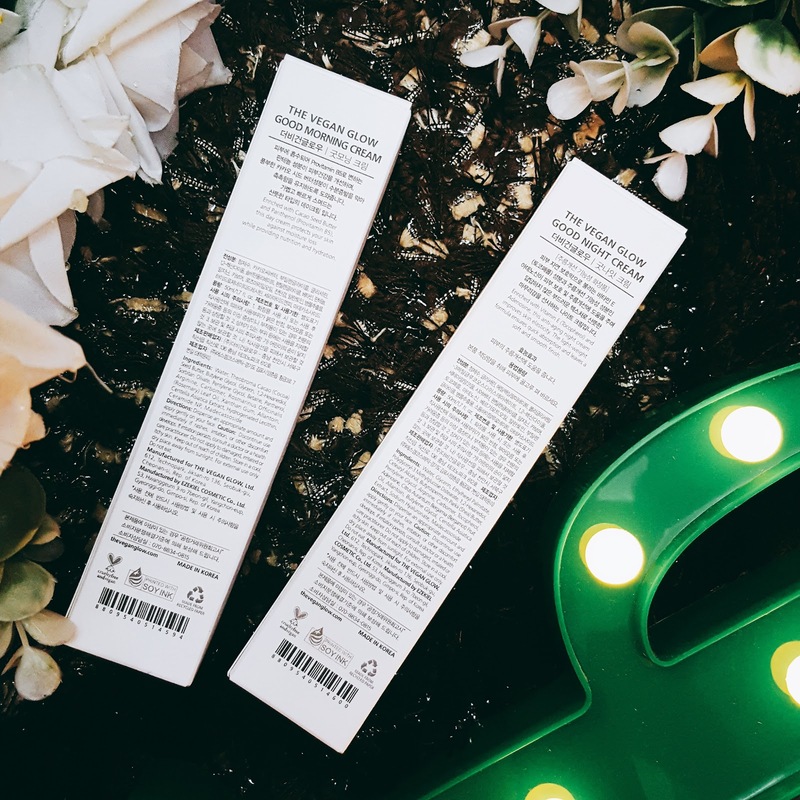 The information about the product and the ingredients are clearly mentioned on both outer and inner packaging. 1) To hydrate and nourish skin. 2) To remove sebum and dead skin cells. 3) To reduce excessive sebum. There are total 70 cotton pads soaked in essence in one container. The product itself has very mild smell to it. The cotton pads are really soft and are soaked in good amount of essence. I have been using this product for a long while now. Honestly, i have been very impressed by it. I have used these cotton pads sometimes even on daily basis for cleansing my skin after a tiring day. After cleansing my face with facewash , i use these cotton pads to double cleanse and trust me they help me clean all the gunk from my pores very easily. These cotton pads also helped me get rid of all the dry patches on my skin in winters. Though i prefer using these cotton pads at night so that the essence can sink deep into my skin but using these cotton pads before applying makeup is also an amazing idea. These cotton pads help smooth out the skin ,making the foundation glide on skin smoothly. One thing i have loved about these cotton pads is that they didn't irritate my skin at all nor did they make my skin super sensitive. I find them very hydrating and soothing. Always use sunblock when you go out in the sun especially when using products which have AHA, BHA or PHA in them. Overall, i am super impressed with the product and I will keep using it to keep my skin hydrated and texture free. For more information about the product, please visit HERE and HERE. This is all for today, i hope you find this post helpful. Thankyou so much for visiting. 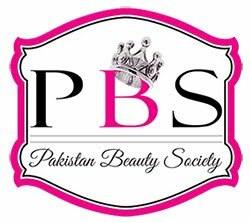 Hello lovelies, today i am here to review a product from SomeByMi. SomeByMi is a well known Korean Skincare brand. Their '30 days miracle' line is the most talked about skincare line in Korea. 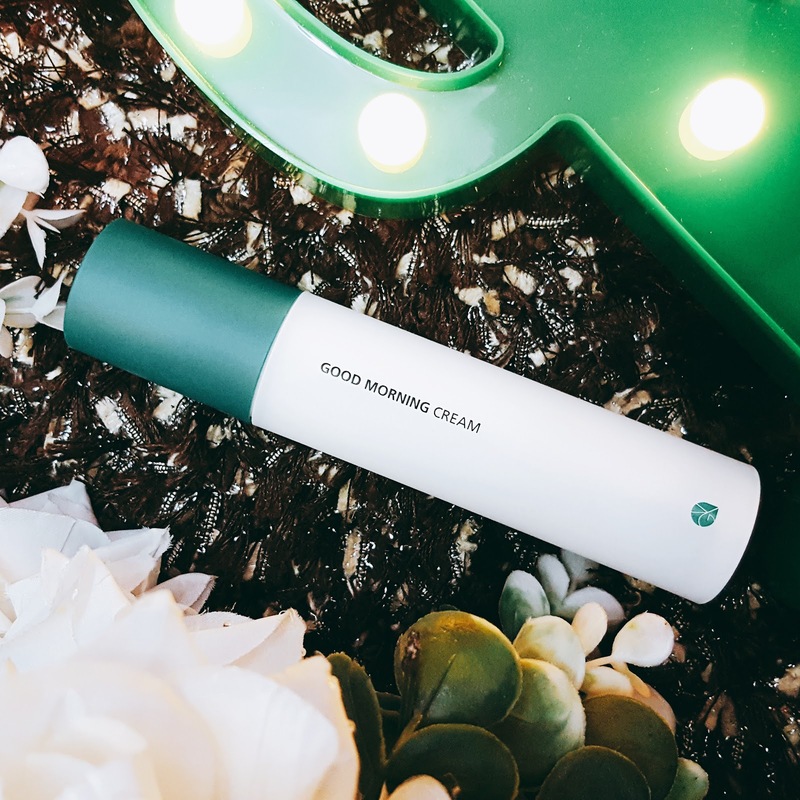 If you are someone interested in Korean skincare , i am sure you must have heard about their '30 days miracle' line. 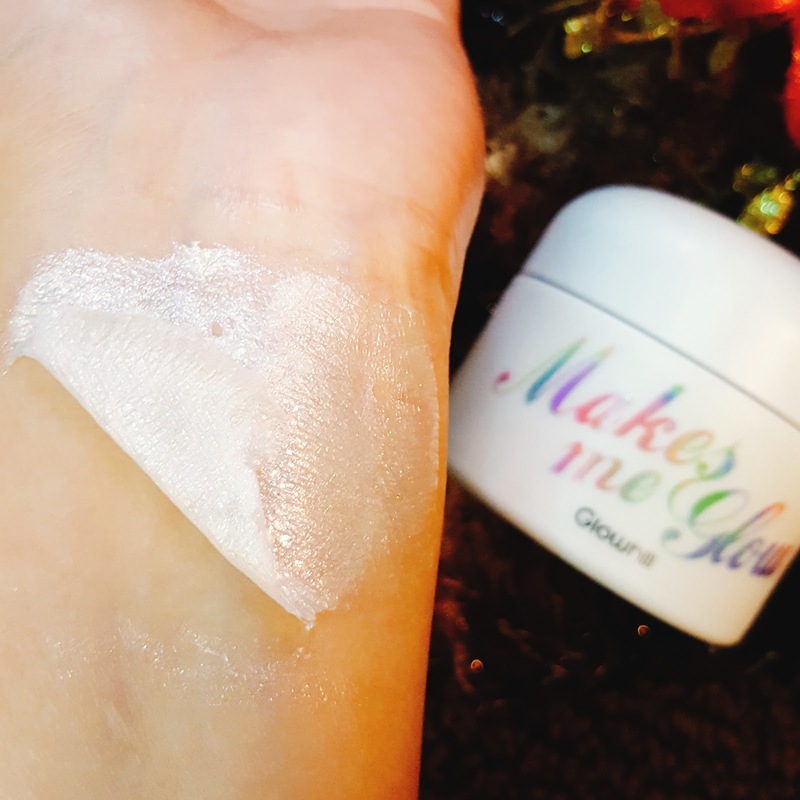 Today i am here too review a product from their new line called 'Galactomyces Pure Vitamin C Glow'. This line has two products so far including a toner and serum but today i am only going to review their toner. 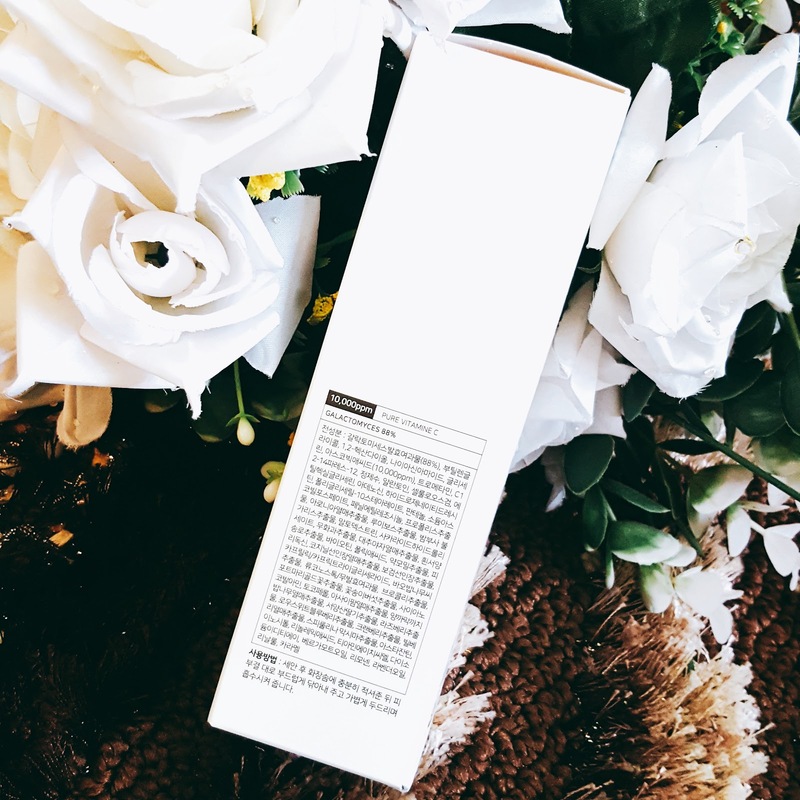 Pure Vitamin C 10,000 ppm: Vitmain C boosts skin collagen production to give you firmer, more plump skin and smooth out fine lines and wrinkles. It also helps to treat all the damage caused by UV radiation. Galactomyces ferment filtrate is a nutrient dense yeast. In skincare products this ingredient significantly helps to reduce the size of enlarged pores as well as blackheads. It also helps to brighten up skin tone, nourish the skin and reduce signs of aging. 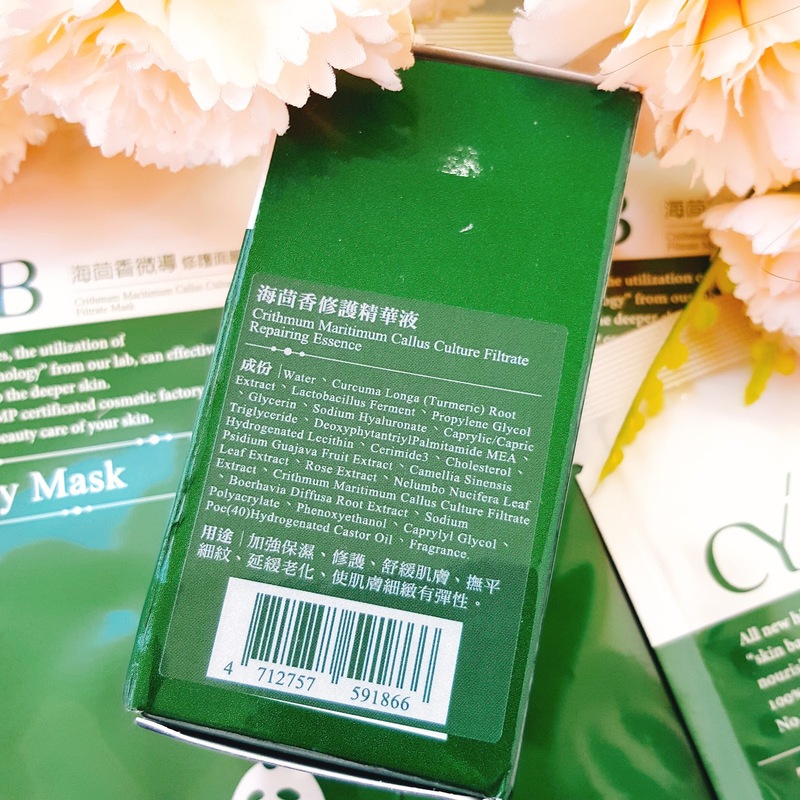 10 Vitamins: 10 vitamins included in this toner are B1, B3, B5, B6, B9, B12, C, E , F and H. As these vitamins are difficult to absorb, they are liposomized so that they can be absorbed easily. It is a brightening solution which contains a variety of natural moisturizers and nutrients found in nature. 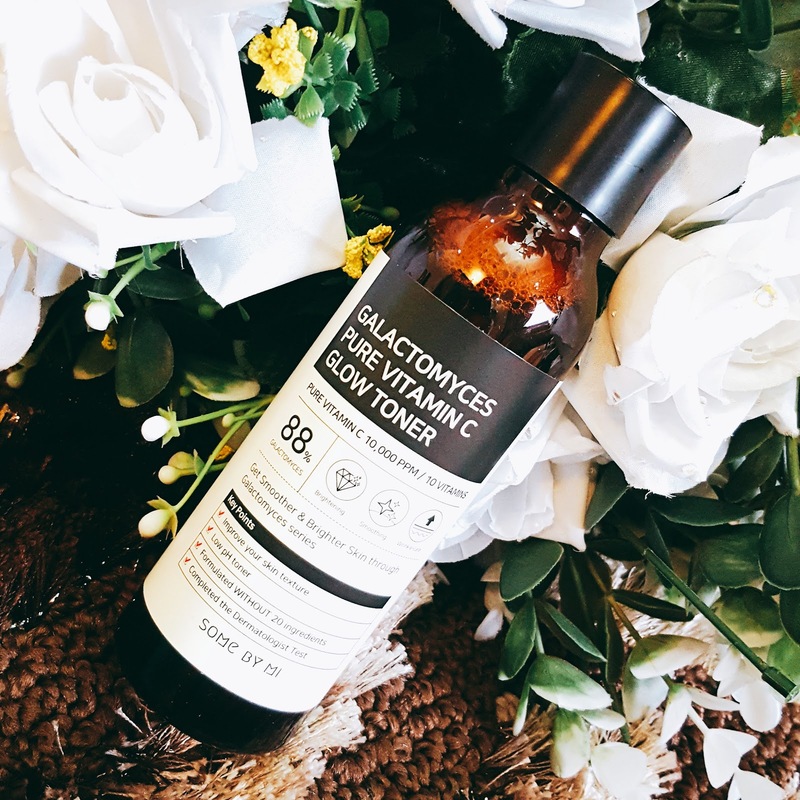 This toner has double brightening synergies of galactomyces and pure vitamin C to keep your skin white and clear. This toner comes in a sturdy brown plastic bottle. It also has an outer cardboard packaging. 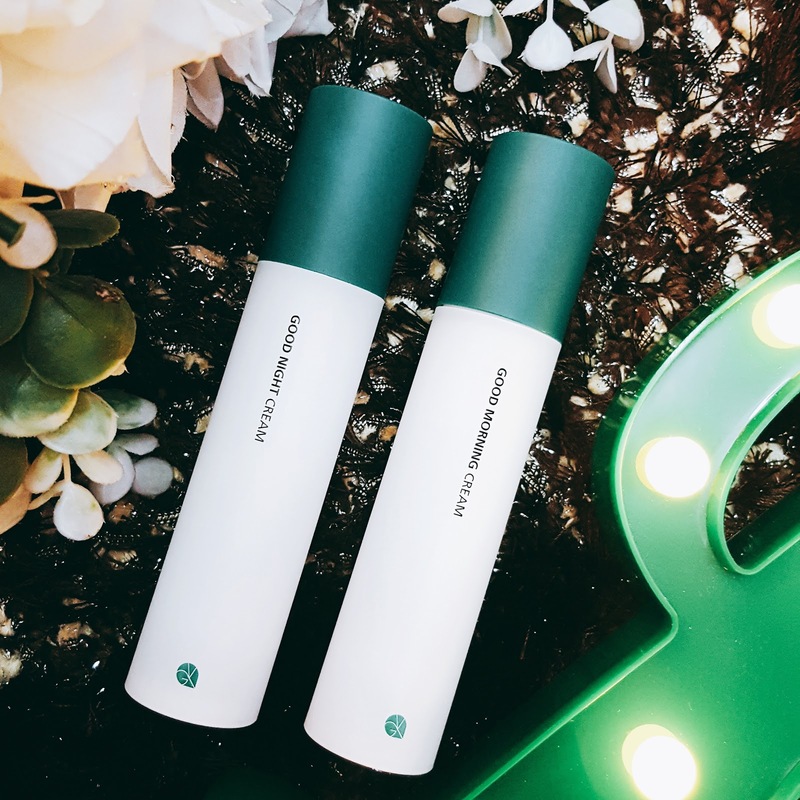 All the ingredients of the toner are printed on both outer cardboard and plastic packaging. 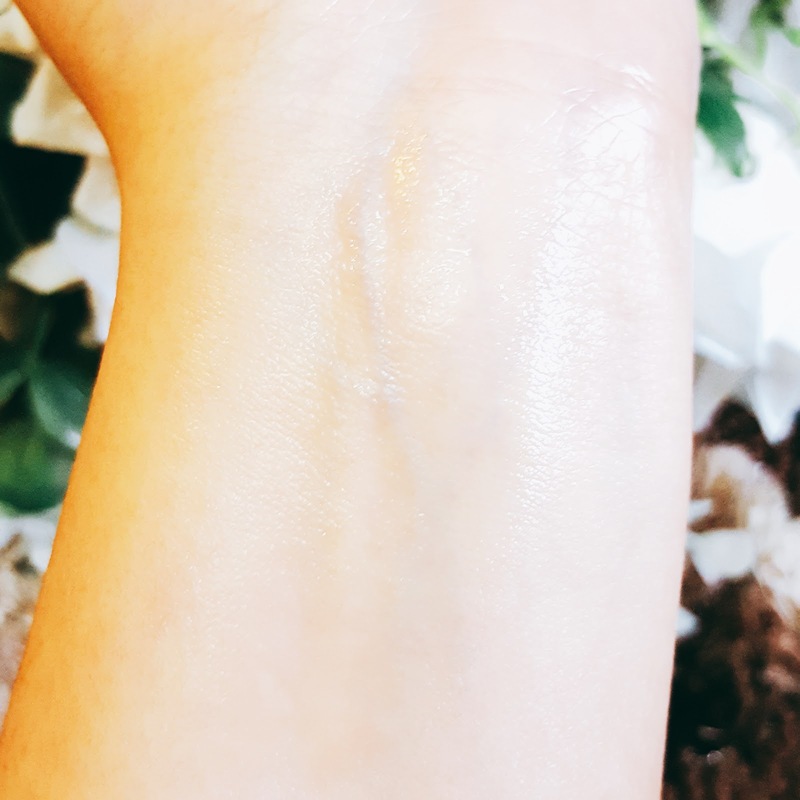 The texture of this toner is watery and it feels really light on skin. The toner itself is tinted and has a pungent smell. The smell is a little strong when smelled directly from the bottle but when applied on skin , it doesn't smell at all or you can say that the smell goes away very quickly. I have been using this toner for a good while now. 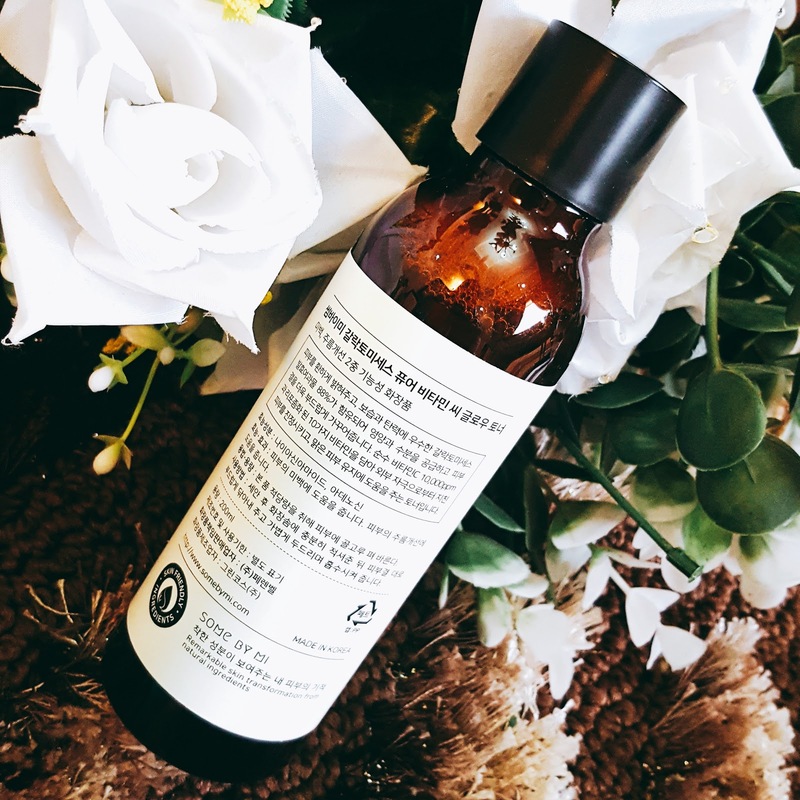 Though this toner can be applied directly on the skin by patting it in with hands but i prefer to use a cotton pad to apply it on my skin. I am really loving this toner, it makes my skin look flawless. I hardly find products which can make my pores look invisible. This toner makes my skin look super smooth. I notice a visible difference in my pores everytime I use it. I have also used this toner under my makeup and it makes my foundation glide on so smoothly. 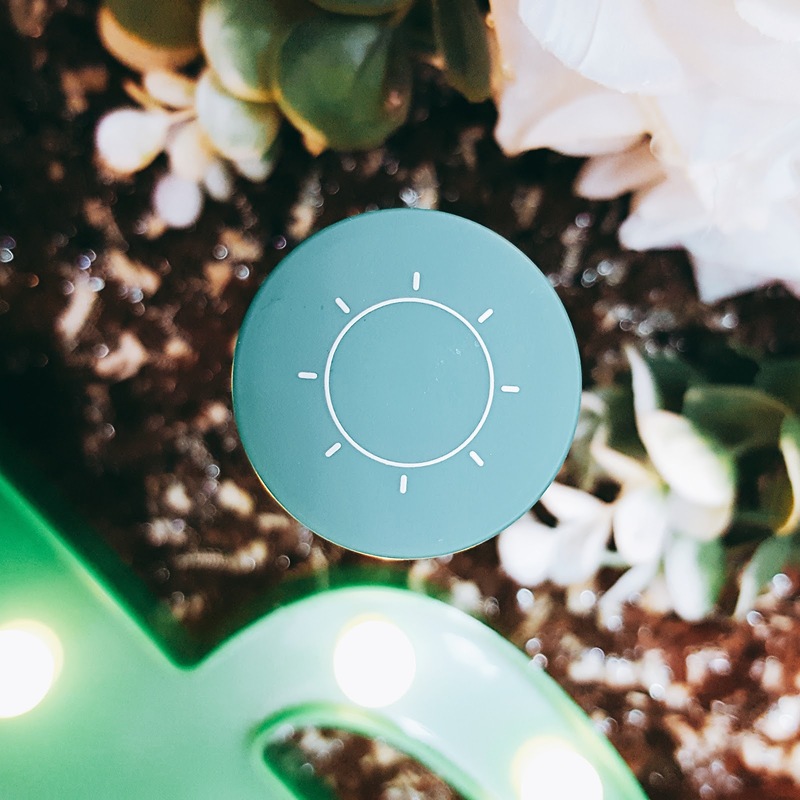 With 2 weeks of use, i have started to notice that my complexion has also brightened a bit and it has helped me fade my dark spots as well. Any product which can help me fade my dark spots automatically becomes my favourite product. My skin is super dry and sensitive but this toner has been so kind to me . It keeps my skin well hydrated and i am so glad that it didn't cause any breakouts. I will continue using this toner and i am sure my skin will improve even more with constant use. Hence, I would like to recommend this toner for all skin types. This is all for today, i hope this review was helpful. For more information about the product please visit HERE. Thankyou so much for visiting. Hello everyone,i am back with another review. Today i am here to review an essence from Cy'lab. 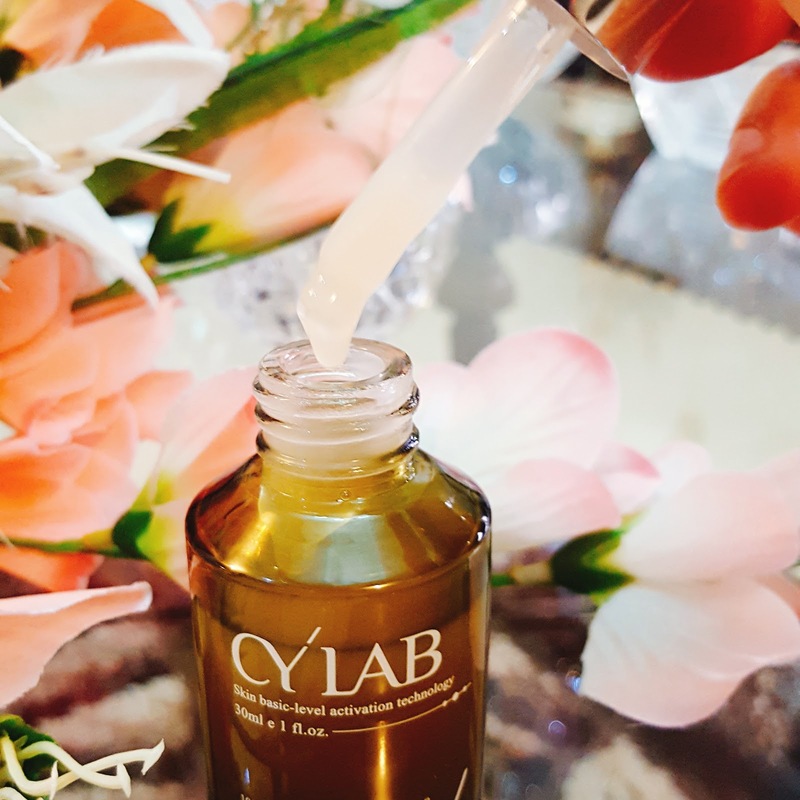 Cy'lab is a skincare brand which produces high level skincare products. 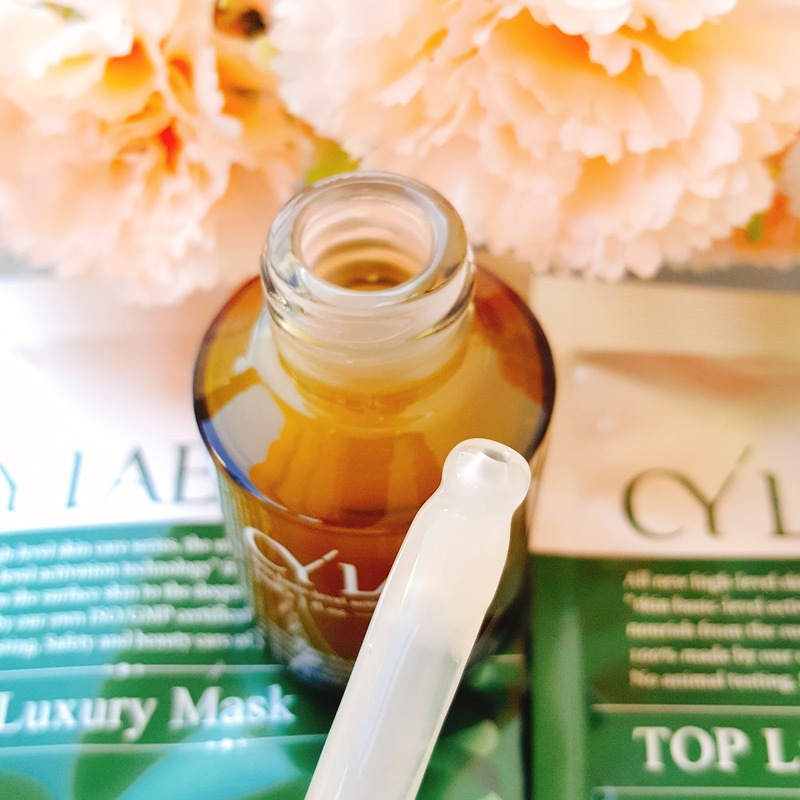 The product i am going to review today is Cy'lab's Crithmum Maritimum Callus Culture Filtrate Repairing Essence. Crithmum Maritimum also known as Samphire or Sea Fennel is an edible wild plant. It is rich in peptides, minerals and Vitamin A, C and E. Peptides are useful for anti-redness and anti-blemish. It also has anti-oxidant and anti-aging properties alongside toning, soothing and conditioning skin. Actosome Lonceramide E06 helps to moisturize and repair skin by absorbing into the skin completely. Curcuma Longa Root extract also known as Turmeric has anti inflammatory properties. It fights off acne because it is a natural anti-septic and helps to keep bacteria from spreading. It also helps in reducing dark circles,help soothe dry skin, protect skin against sun damage and aging. Sodium Hyaluronate has ability to help extremely dry skin from flaking. Continued use of sodium hyaluronate provides anti-aging, wrinkle smoothing and exceptional moisturizing benefits. Boerhavia diffusa Root Extract is an extract from flowering plant. It has strong skin-soothing and antioxidant properties. This essence comes in a beautiful green tinted glass bottle (the bottle colour is looking brown in these pictures because of sunlight). The glass bottle itself comes in a Green and white cardboard box. I really like the packaging of this product. The glass bottle is not just aesthetically pleasing but it also has a very expensive look to it. The essence can be taken out from the glass bottle with the help of a dropper which I find very hygienic. This glass bottle contains 30 ml of essence. 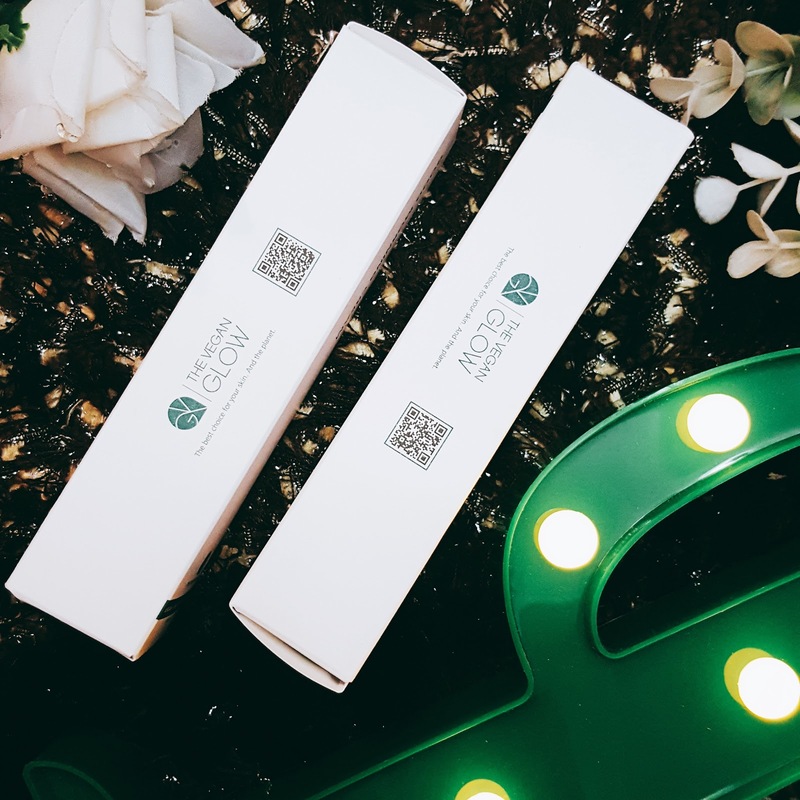 The essence itself is as thick as a serum but it doesn't feel heavy on skin at all.It gets absorbed into the skin completely leaving my skin really smooth and soft. It has a unique smell to it. It reminds me of one ointment i used to use when I was a little kid. The smell itself is very subtle so you don't have to worry about it at all. 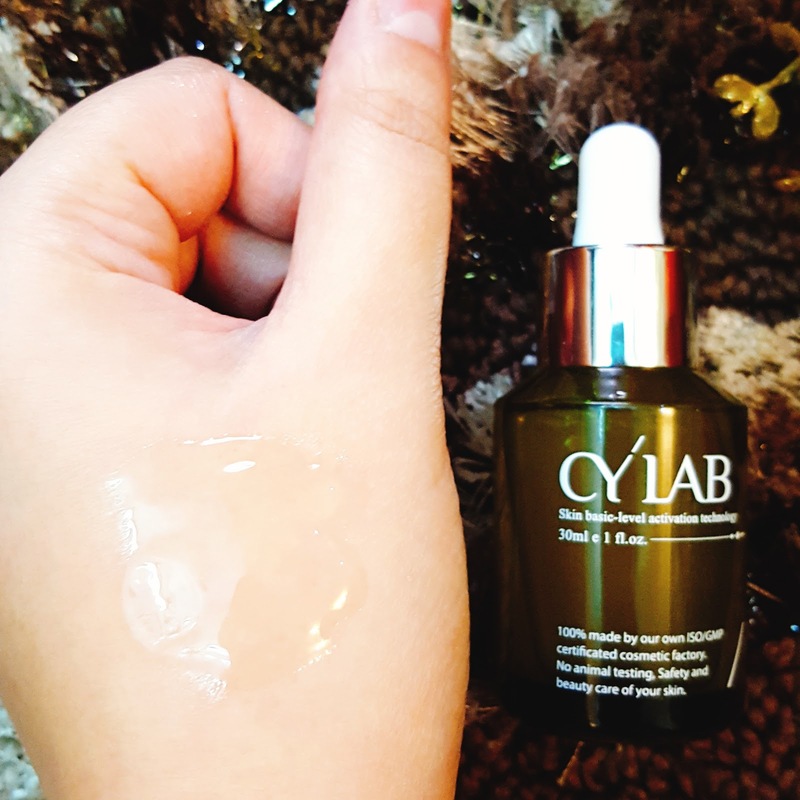 I have used this serum for more than a month and i have loved using it. A little bit of this serum goes a long way hence i still have a lot of product left in my bottle. One thing i have noticed about this essence is that it gives instant results. Beside making my skin look smooth, it brightens up my skin as well. 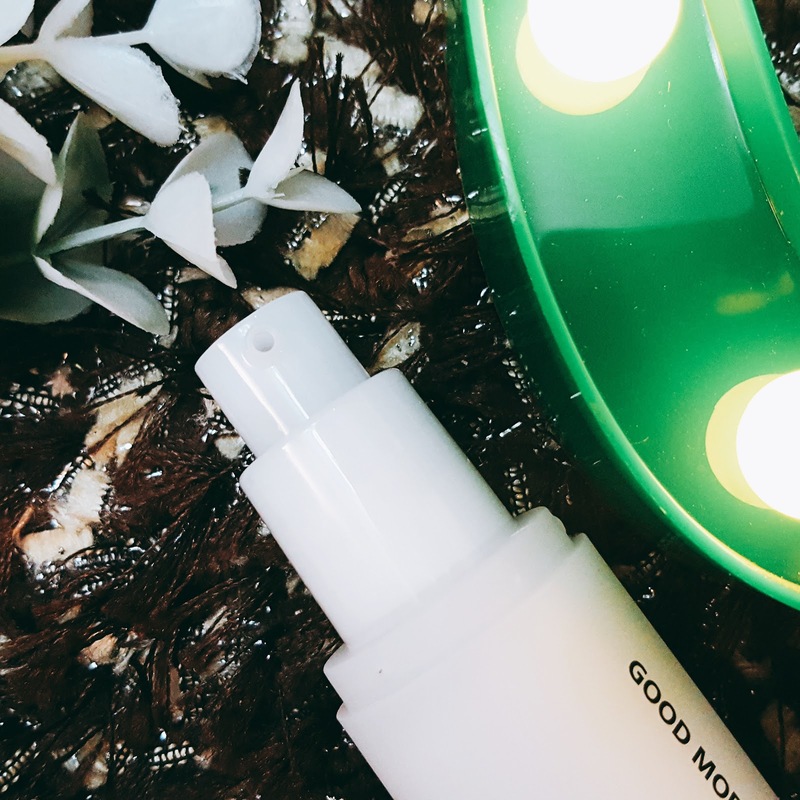 I use this essence during night time and trust me it astonishes me how my skin looks so supple and bright in the morning everyday. 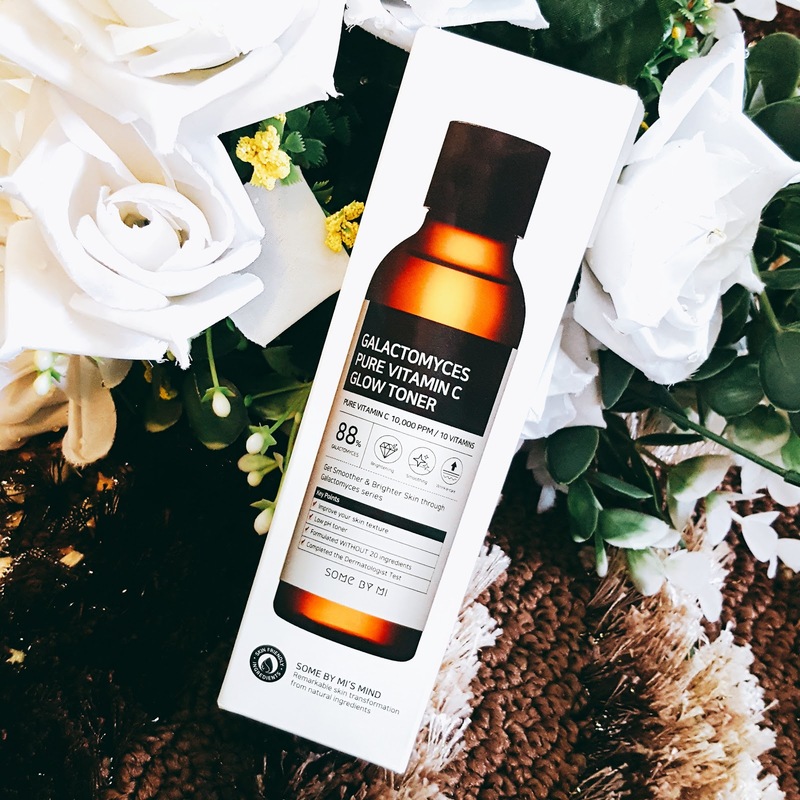 Overall, i am super impressed with this essence and i would like to recommend you guys to try this one if you are looking for something to help you smooth and brighten your skin-tone. 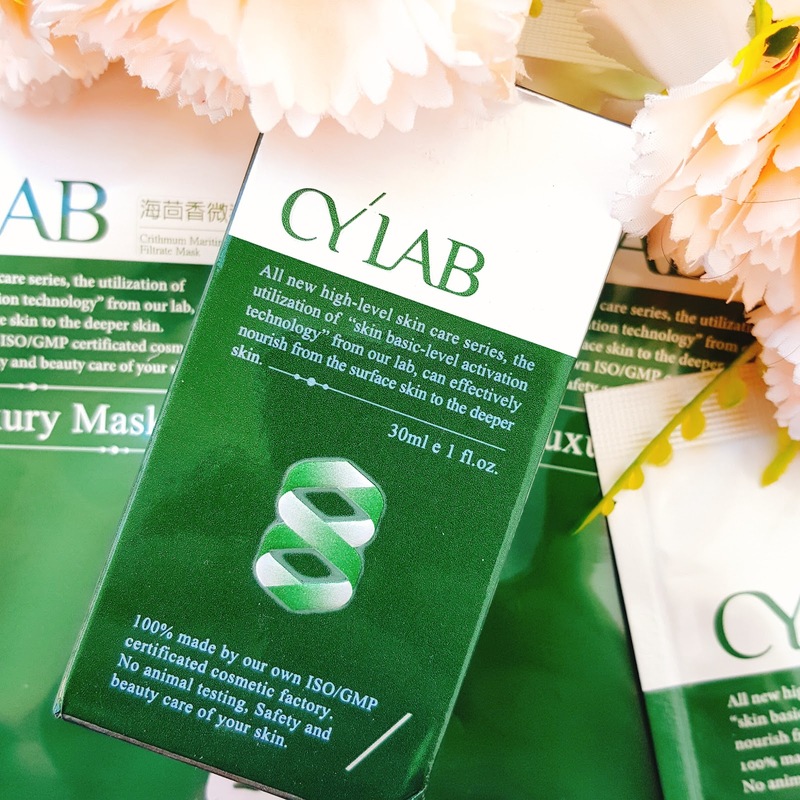 As this essence also contains ingredients which help in anti-aging so i will continue using this product and hope that it works in that department too. This is all for today, i hope you find this post helpful. For more information about this product please visit HERE. Also checkout the product texture on my instagram HERE. Thankyou so much for your visit. Hello everyone, i hope you are doing well. Today i am here to share my 2019 wishlist from Dresslily. Dresslily is an international store which carries a variety of products including clothes, accessories, home decor items and much more. This roll tab sleeve tartan blouse is the first thing that caught my eyes. It is a checkered blouse and checkered blouse/shirts always attract me. This shirt can be worn causally with jeans. I really like the buttons and the front pocket on the front side of the shirt which gives it a comfortable look. This shirt is only valued and 19.21 $ which is quite a fair price. This beaded skinny jeans is the second thing which caught my attention. I really like the white beads in contrast with the black skinny jeans. These jeans can also be worn casually. They would look good either paired with a crop top or the even with the shirt which I shared above. This skinny jeans is worth 25.40$ on Dresslily and i think it is worth the price. Who doesn't love backpacks? I for one love backpacks and this Vintage Pu leather backpack seems like a perfect companion for me to travel with. This vintage leather backpack is so appealing to the eyes plus I love the zipper in the front of the backpack which makes it look even more appealing. This backpack is 22.27$ worth on the store. As soon as i opened the shoes category on the website , these high heels grabbed my attention. These high heels in white literally made my heart flutter plus they are pointed towards the front which is how i like my shoes anyways. These high heels can be worn formally and they would look good with every dress. They are valued at 38$ and by the look of it, i think they are worth the price. This is my wishlist from dresslily, which products are you interested in buying from dresslily? Share your wishlists below. Also checkout some new arrivals on the store, they look amazing. It's time to refresh your wardrobe! DressLily has prepare the best high-quality but low-prices products for you, make you free under all occasion for Monday to Friday. This is all for today, i hope you enjoyed this post, for more please keep visiting. Thankyou. 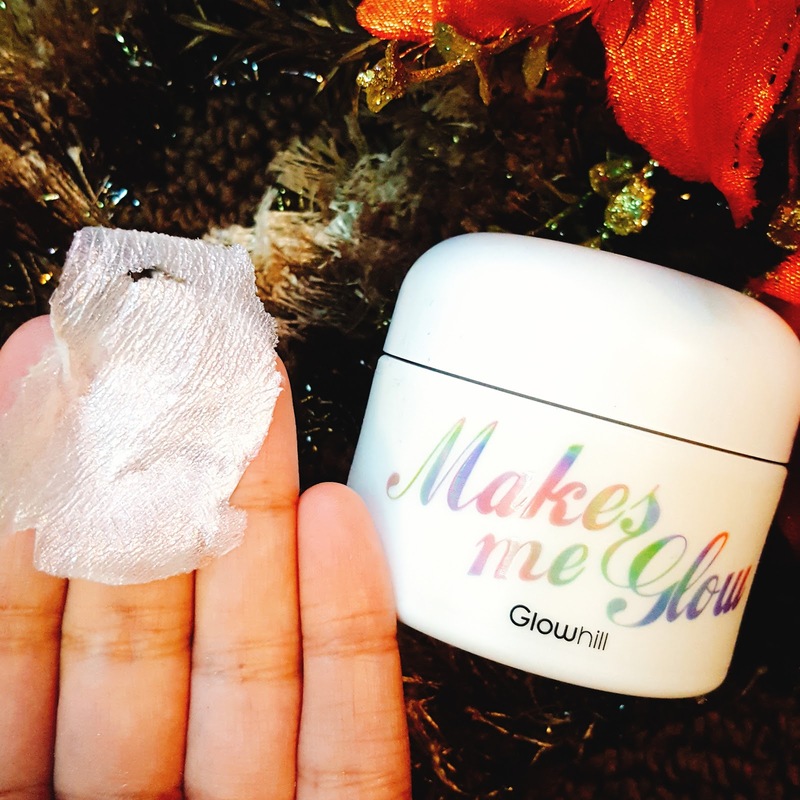 Hello lovelies, i'm back again with another review. 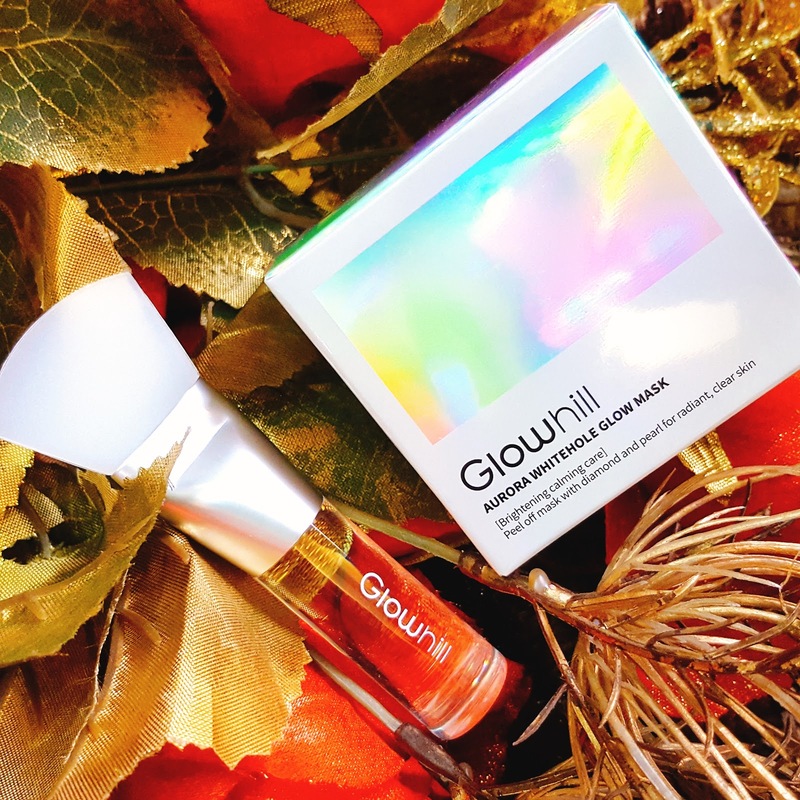 Today i am going to review two products from the brand called 'The Vegan Glow'. 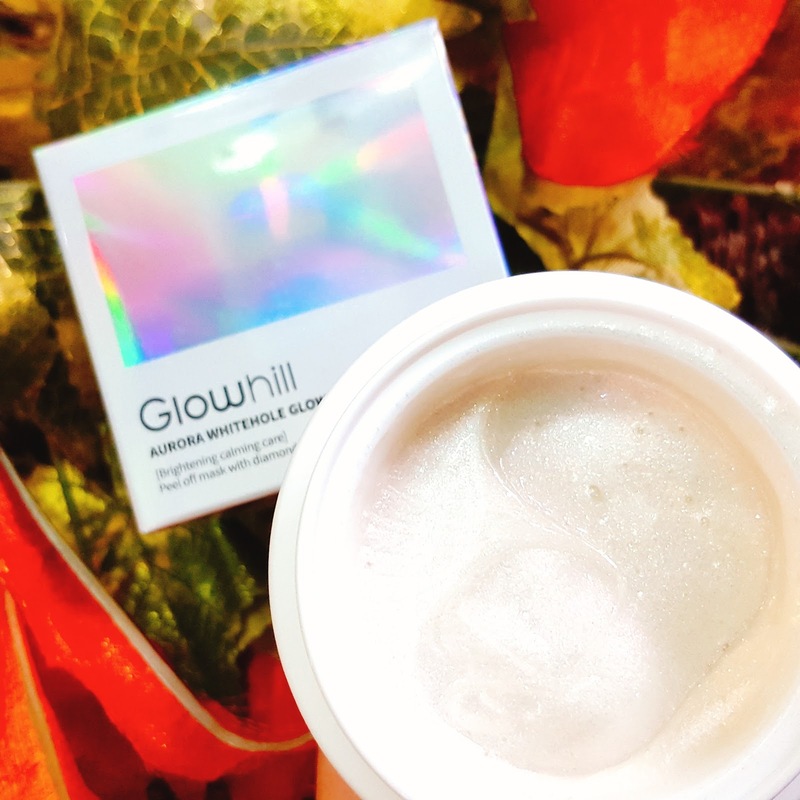 The Vegan Glow is a vegan Korean skincare brand. 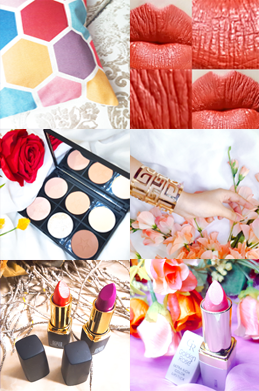 Their products are completely free from animal derived ingredients. Both creams comes in a pure white outer cardboard packaging. 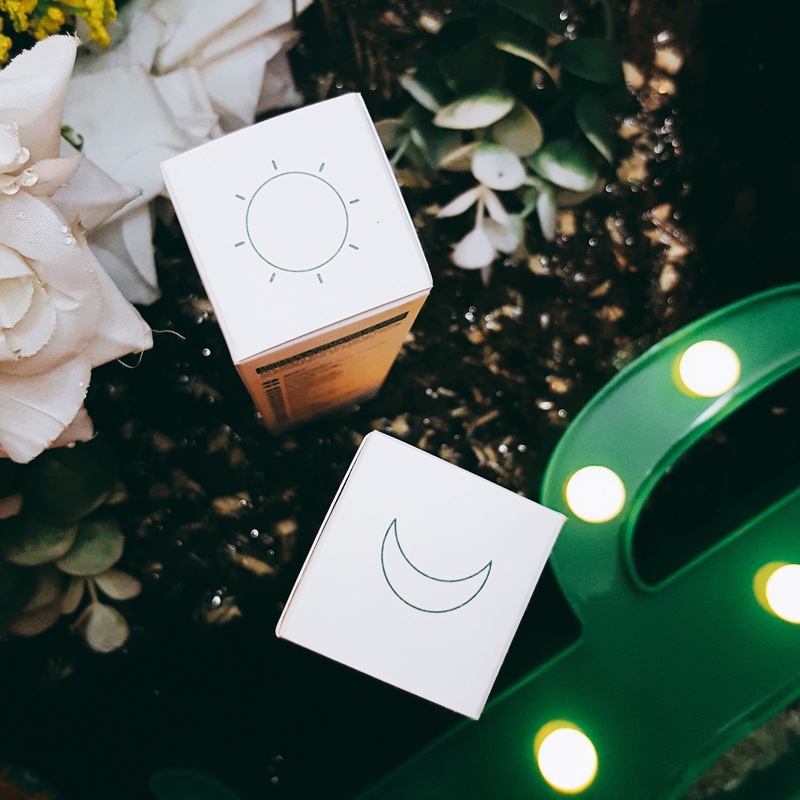 Sun is printed on the top cover of day cream box and moon is printed on the top cover of night cream box.The product itself comes in a sturdy plastic bottle. The bottle itself is pure white and the cap of the bottle is green in colour. 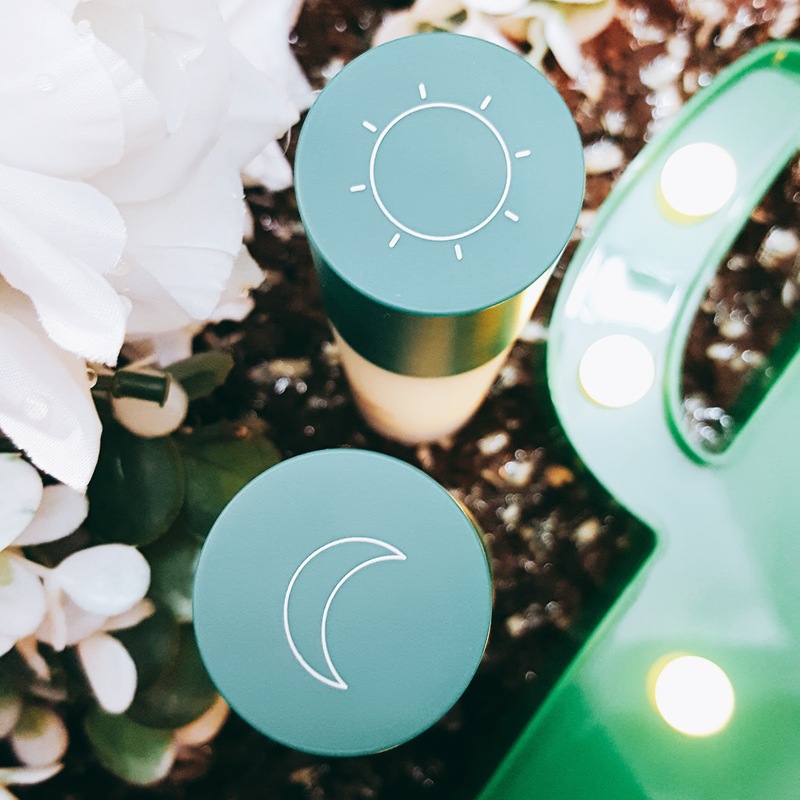 I absolutely adore the simple packaging of these creams especially because of the sun and moon printed on the caps of the bottles. The cream itself comes out through an airless pump which i find very hygienic. I like the way the airless pump works. It takes out the right amount of product needed. It doesn't splurt out a lot in one pump which i really like because this way the product doesn't go to waste. 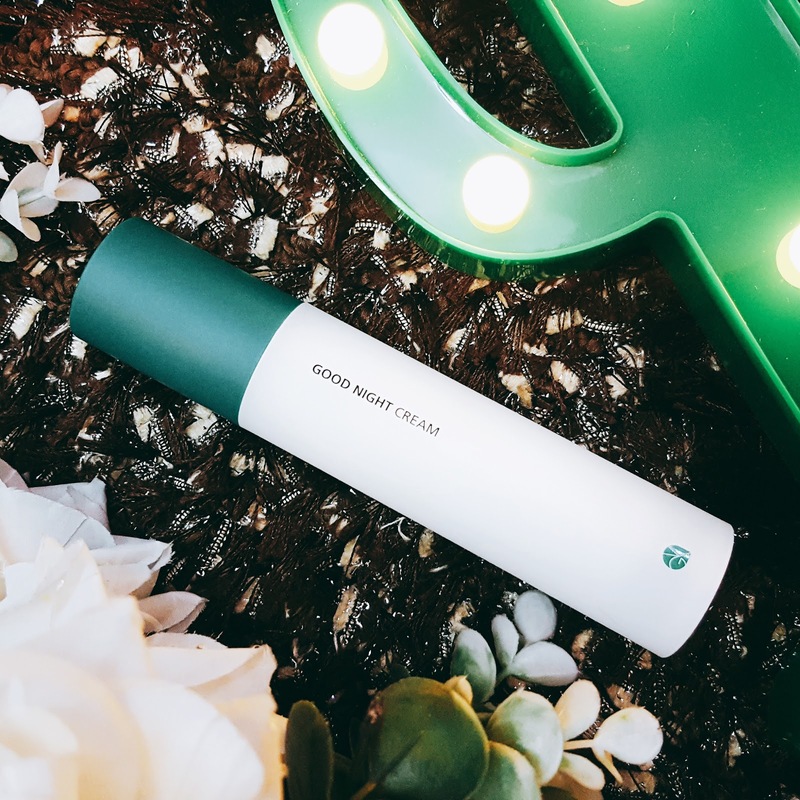 Good Night Cream by The Vegan Glow is enriched with Vitamin E and Adenosine alongside other ingredients. Vitamin E is a powerful antioxidant that may be effective at reducing UV damage in skin. Vitamin E also helps nourish and protect your skin from damage caused by free radicals. Adenosine is a skin soothing and restoring agent. It has proven to have anti-wrinkle benefits to make the skin look smoother and younger. 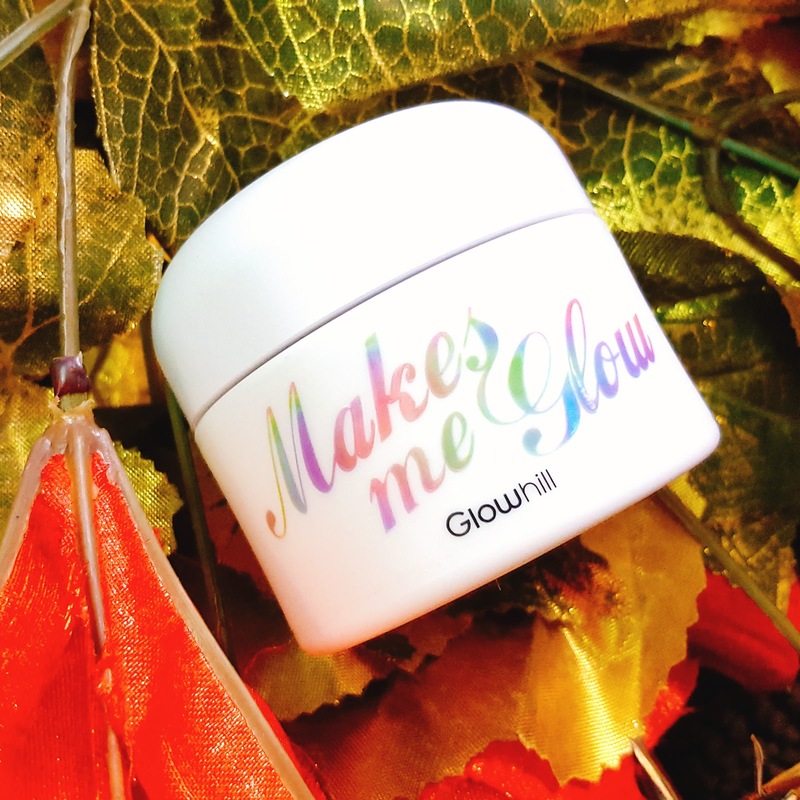 Good Morning Cream by The Vegan Glow is enriched with cacao seed butter and Panthenol (ProVitmainB5) among other ingredients. Cacao Seed Butter is high in fatty acids, which is why it is often touted for its ability to hydrate and nourish skin and improve elasticity. The fat in cocoa butter forms a protective barrier over skin to hold in moisture. One common use of cocoa butter is to smooth scars, wrinkles and other marks on skin. Panthenol when applied to skin it penetrates deep into the skin. It helps in hydrating and moisturizing the skin from inside. It is also anti-inflammatory, hence helps with redness and soothing dry skin. I have been using these creams for a month now and i absolutely love them.Both creams have a very fresh scent to them. I find the scent of these products very calming. 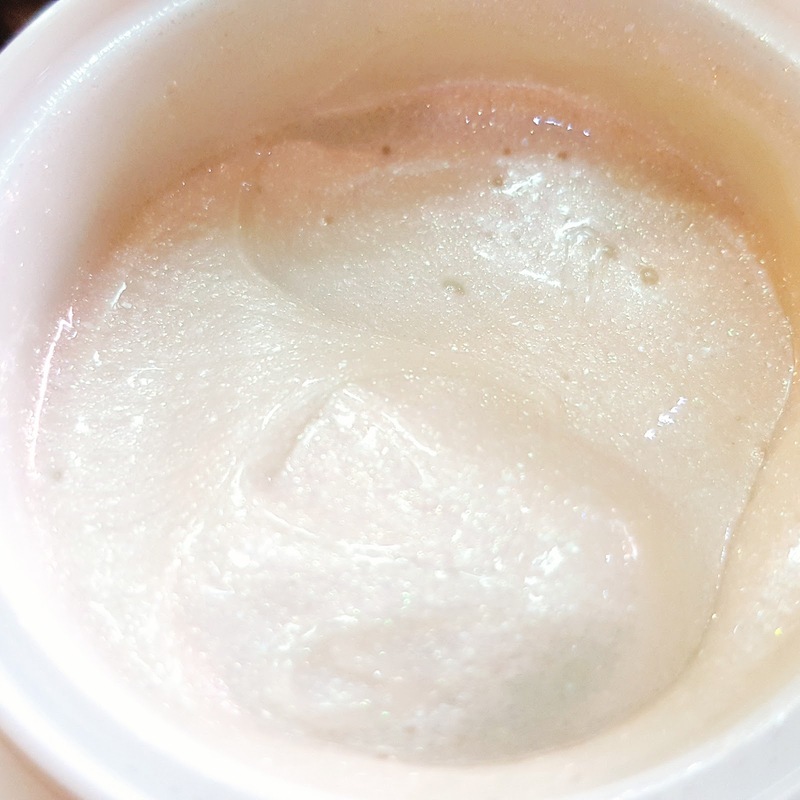 The texture of both creams is also similar. The product when pumped out is in solid form and white in color but as soon as you rub it, it becomes transparent. 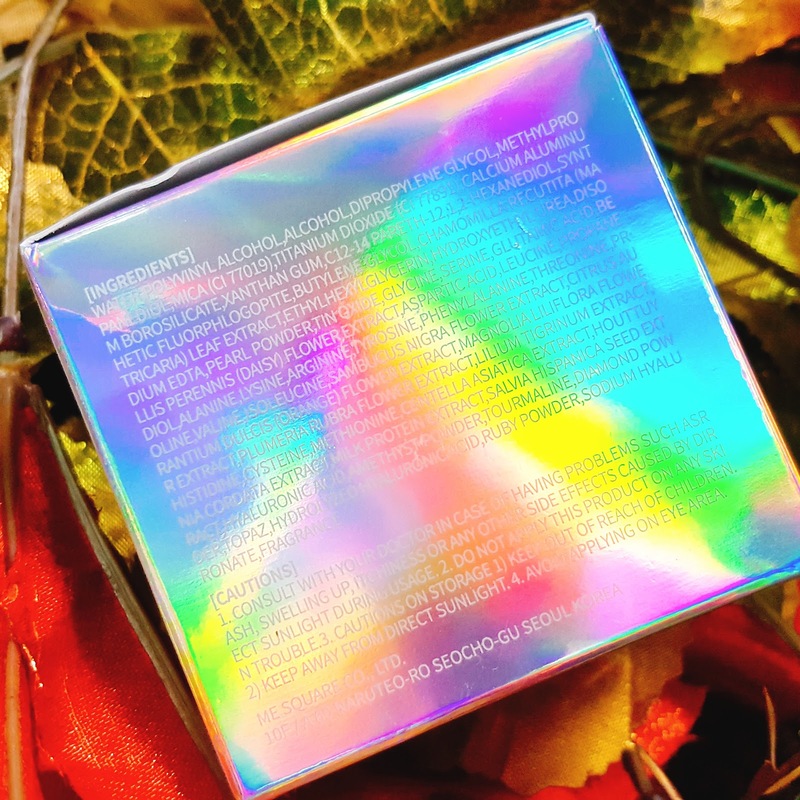 The product sinks into the skin completely and doesn't feel oily or sticky on the skin at all. During the time period i have used this cream, i didn't have any sort of breakouts or skin issues like redness. 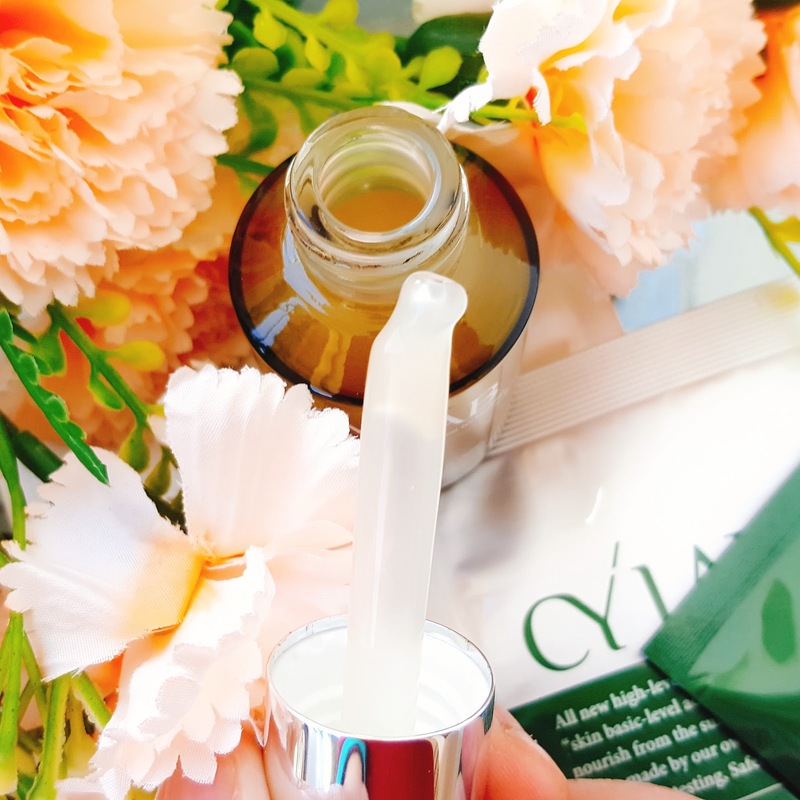 As i am getting older and my skin is aging,i do feel that these products are helping me tighten my skin. My skin feels super soft, hydrated and bright after using these creams. 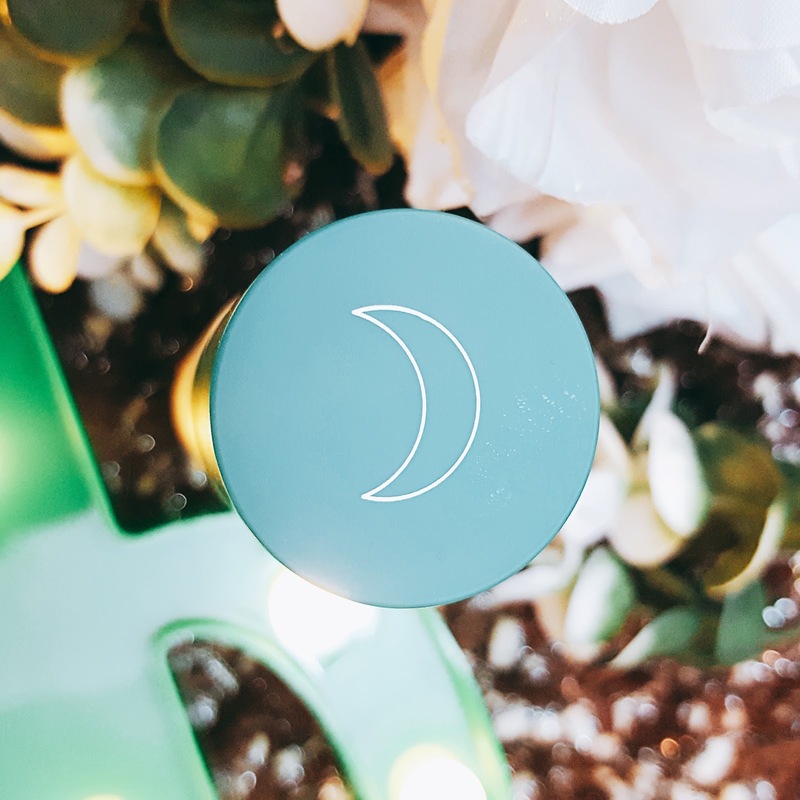 I have been using the night cream during the night time and morning cream in the morning everyday so it is hard to tell that which cream is doing what for my skin , hence i have reviewed them together. 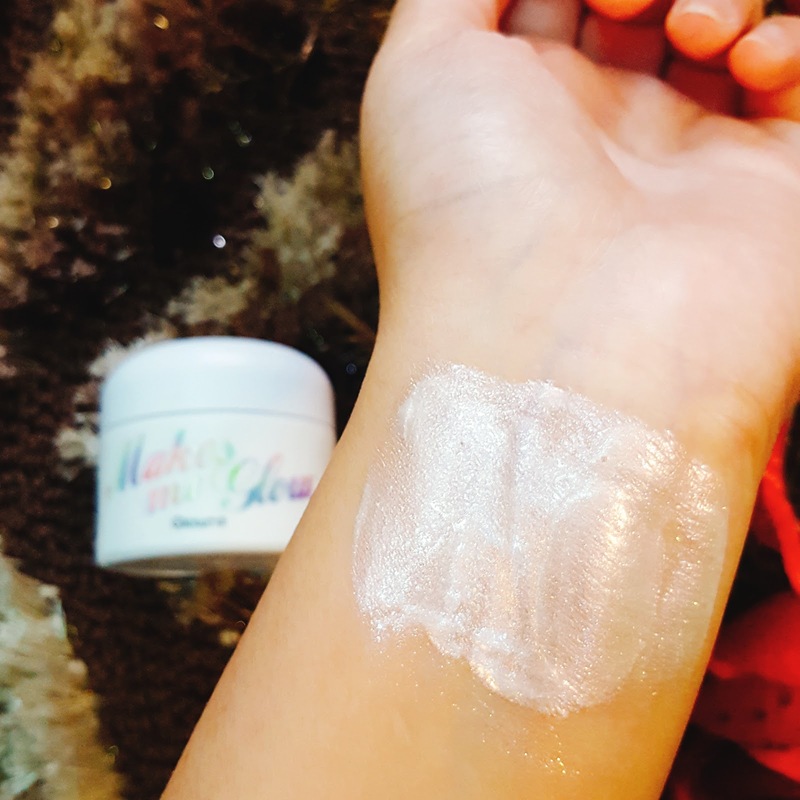 Overall, I am really impressed by both creams and i will continue using them until i run out because they work really well for my skin. This is all for today, for more information about the products please visit HERE. I hope you find this post helpful, for more posts like this, please keep visiting, thankyou. 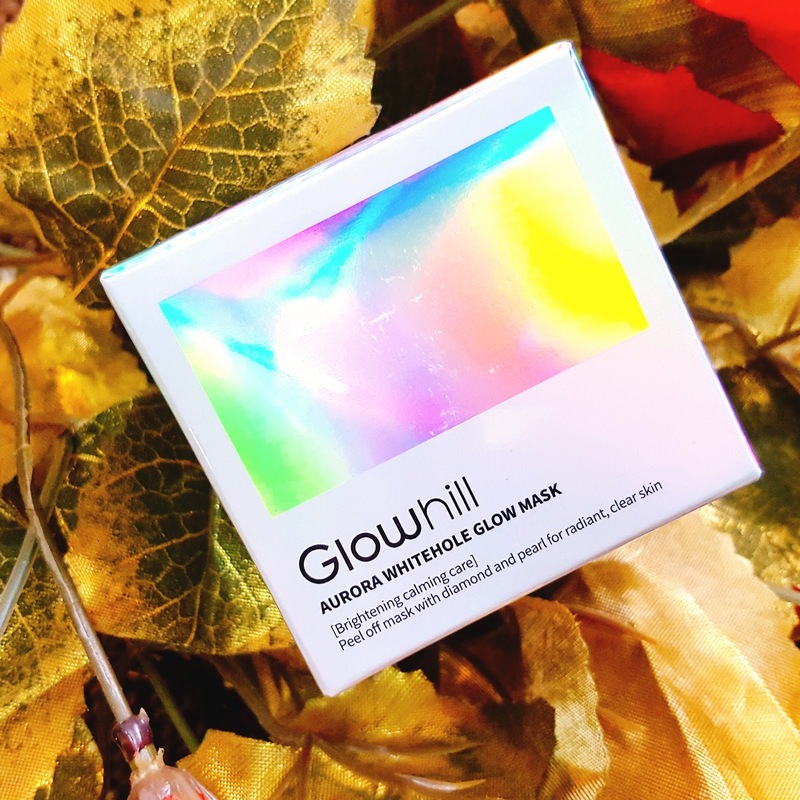 Hello lovelies, i am back with another review. 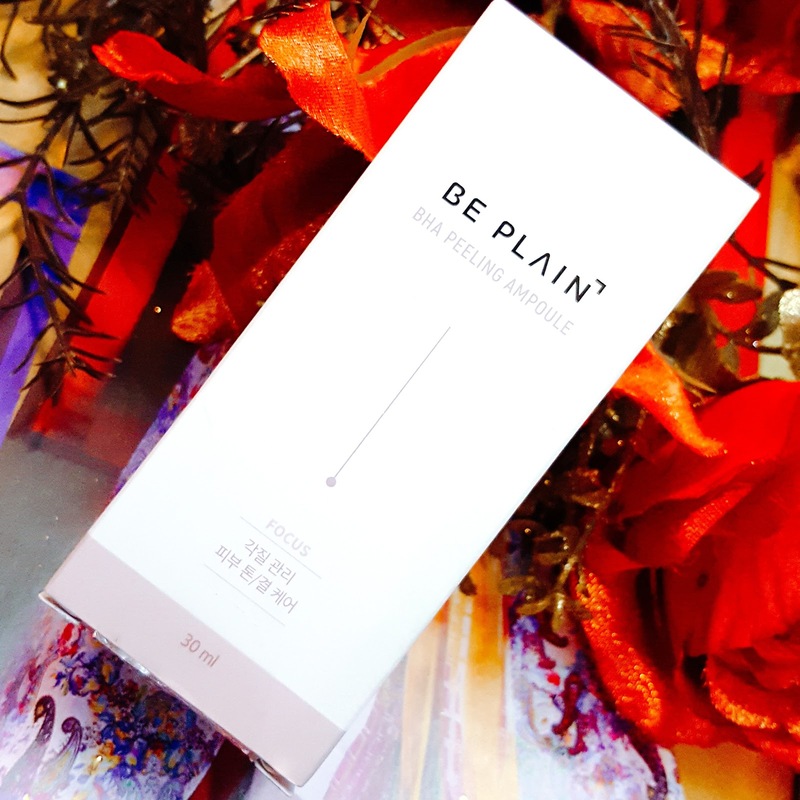 Today i am here to review products from a brand called Be Plain. 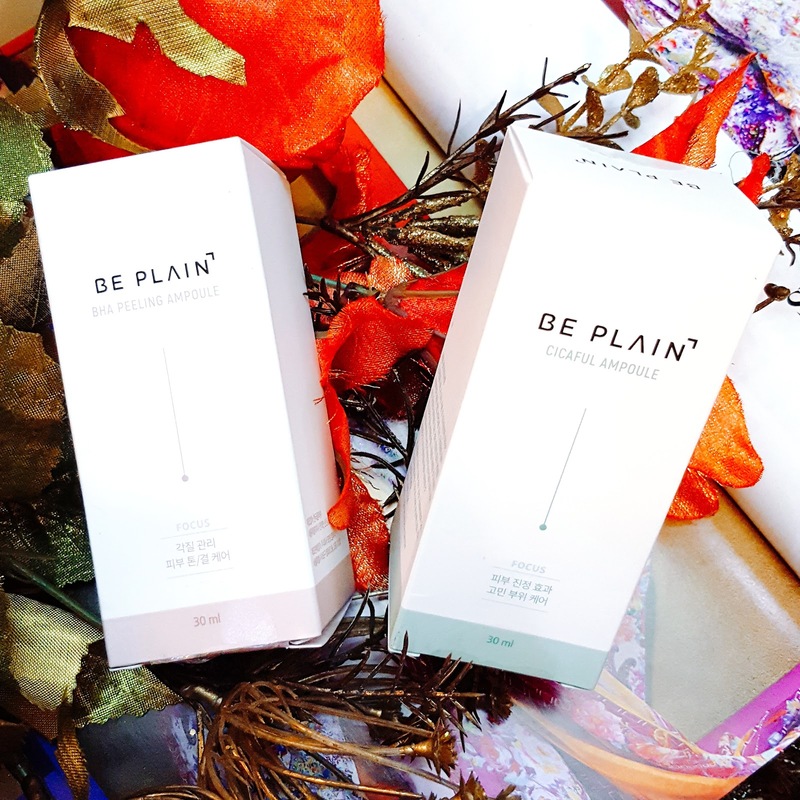 Be Plain is a korean cosmetic brand and they aim to seek essential ingredients for real life results. 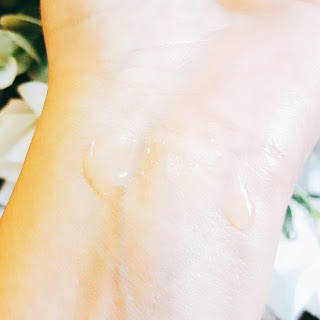 Be plain promises to customize treatments for unique skin problems and never use harmful ingredients even if they generate noticeable effects. The outer cardboard packaging of the products is pretty simple whereas the products themselves comes in frosted glass bottles. The product itself can be taken out from the bottle with the help of the dropper. I enjoy products which comes with a dropper as it is not just easy to use but is also very hygienic. In this time n age, i am sure all of you are well acquainted with the term/ingredient BHA. If not, kindly do check out my insta post HERE, i have briefly explained BHA there, i hope you find it helpful. 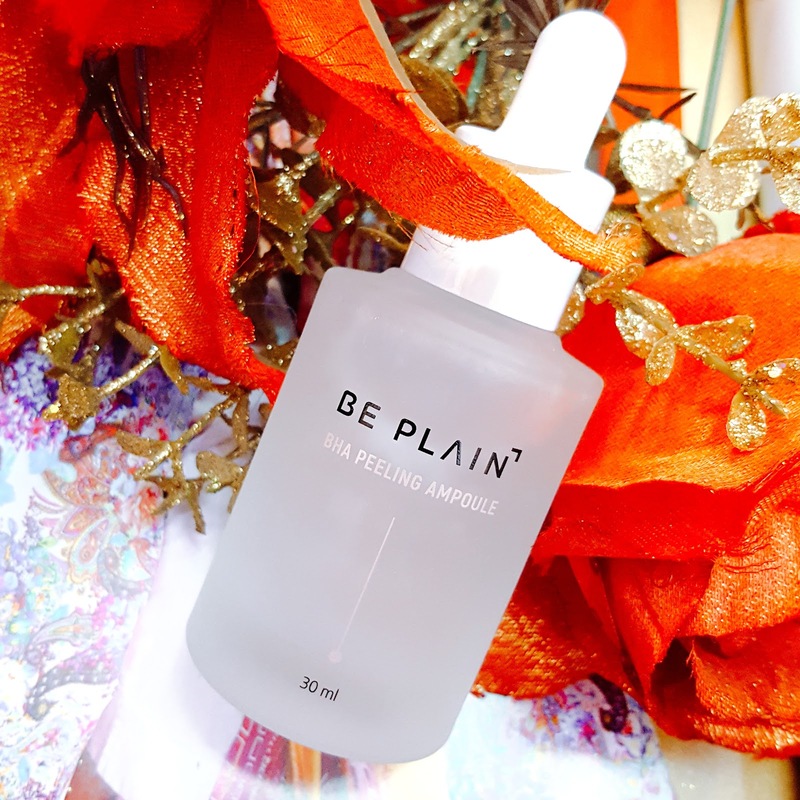 BHA peeling ampoule by Be Plain is a highly concentrated ampoule for home peeling filled with BHA and green tea water. It has 80 percent of green tea water and 2,200ppm BHA. This product is designed to get rid of excessive rough and dry skin with mild exfoliation. According to the brand , this product is suitable for all skin types. To use this product, adjust your skin's ph level with the help of a toner. 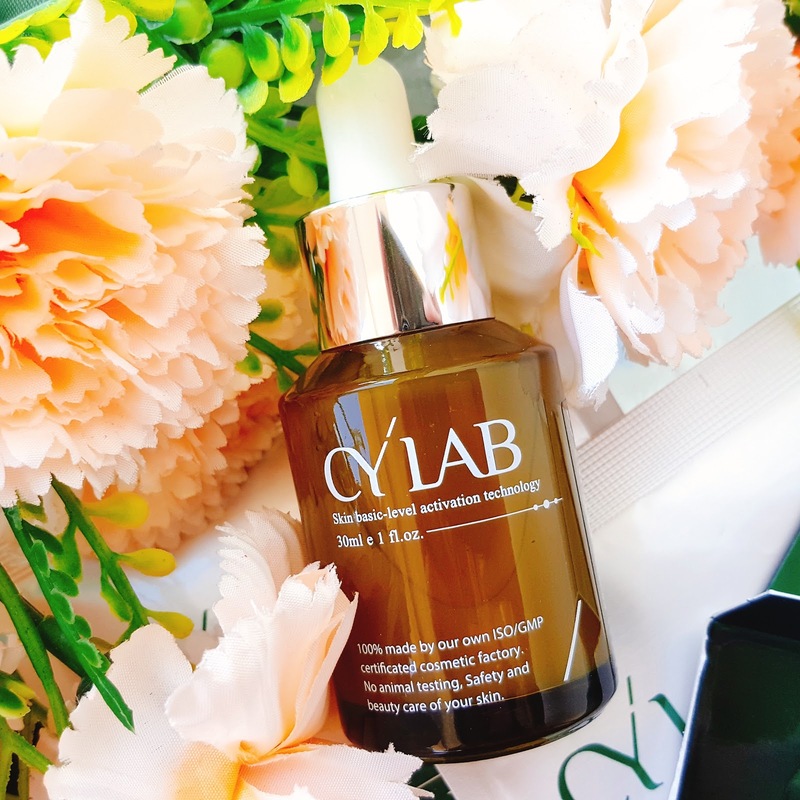 After letting the toner sink into your skin, apply this ampoule evenly on your face only in evenings. 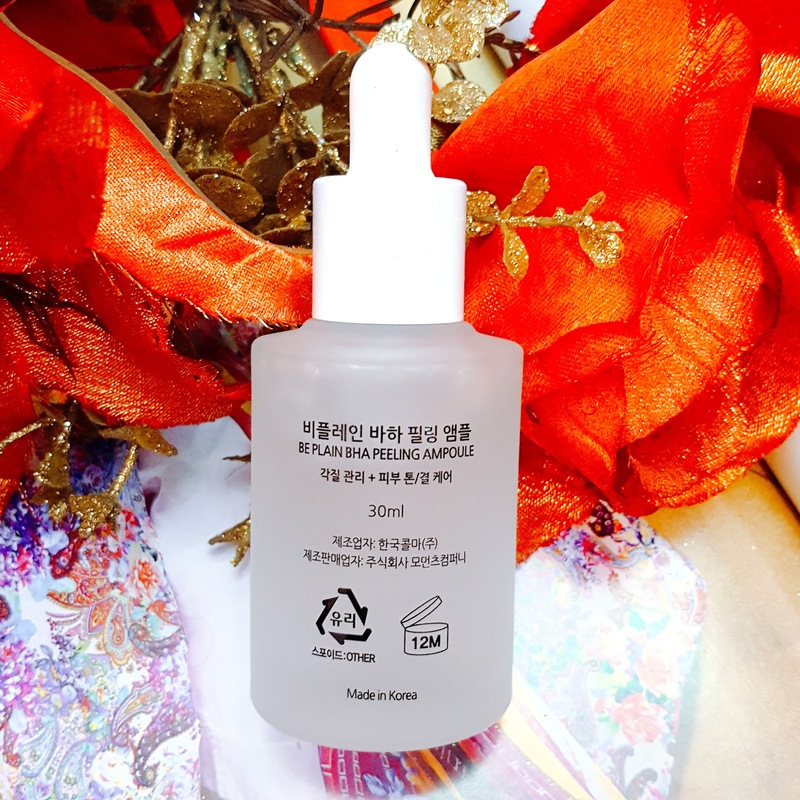 I have been using this BHA ampoule for a month now. This ampoule has a watery consistency and has no smell at all. To checkout the consistency of this ampoule checkout my latest Instagram post . 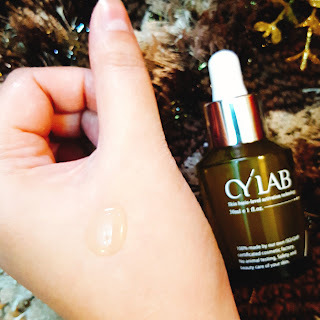 I apply this ampoule during the evening time because BHA's does make skin a little sensitive hence it is recommended to avoid sunlight exposure when using BHA. Ampoules are mostly milder versions of serums. As this is also an ampoule it is very gentle on skin. I have sensitive skin so i prefer products which are gentle on my skin otherwise my skin becomes blotchy. I have been enjoying this product on and off for the past month because it helps my skin get rid of dry n dead skin whenever i need it. The results are not so prominent because it also caters to people who have sensitive skin like me. If you are someone who uses higher level of BHA, this product might be mild for you. For me it does what it claims, which is to get rid of dry/dead skin. Sometimes I apply this ampoule at night and i wake up to the most softest and smooth skin. 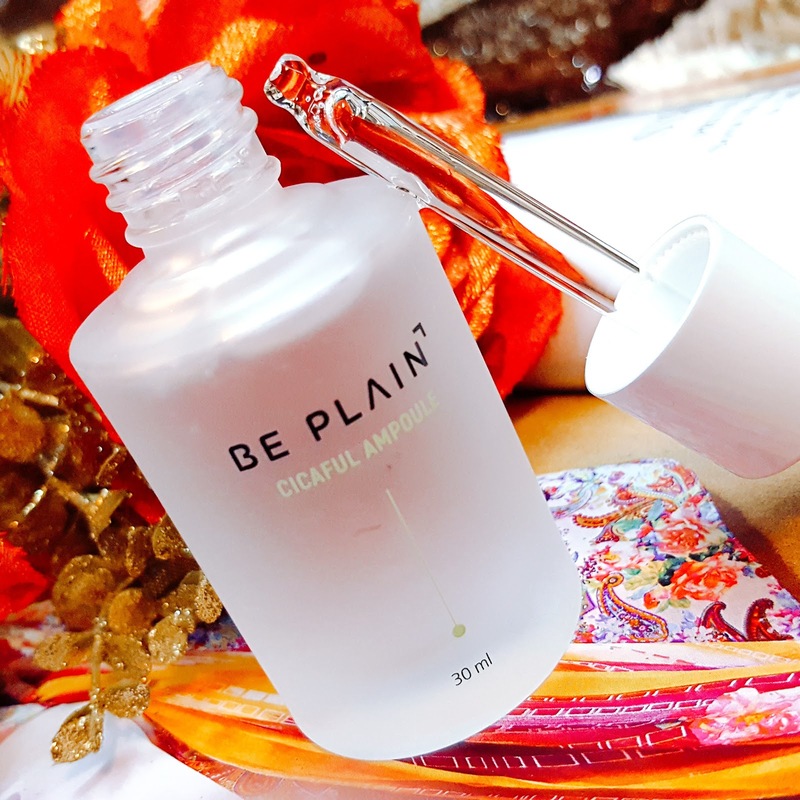 Cicaful Ampoule by Be Plain is a highly concentrated nutritional ampoule composed of over 84 percent Centella Asiatica extract for skin recovery. Centella Asiatica is a herbaceous plant. It is found in many skincare products because of its anti-oxident properties. It is a hydrating ingredient to soothe upset skin. 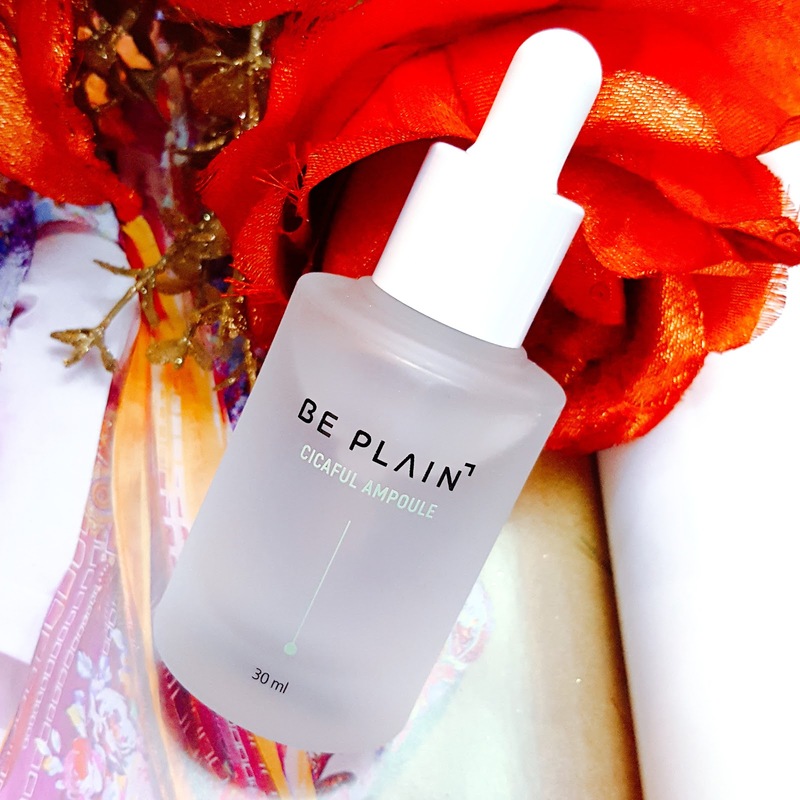 Similar to the BHA ampoule the texture of this product is also watery, it doesn't feel heavy on the skin at all and sinks into the skin very easily. This ampoule has no smell at all which is really amazing. This product helps to manage redness, prevent acne and ease skin irritation. It is suitable for all skin types. Apply evenly on skin on mornings and evenings. I sometimes use this product alone in the morning and sometimes mix it with my foundation to help my foundation glide smoothly. This ampoule surely helps calm down my skin. I use this especially on days when i feel my skin is irritated or is on the verge of breaking out. 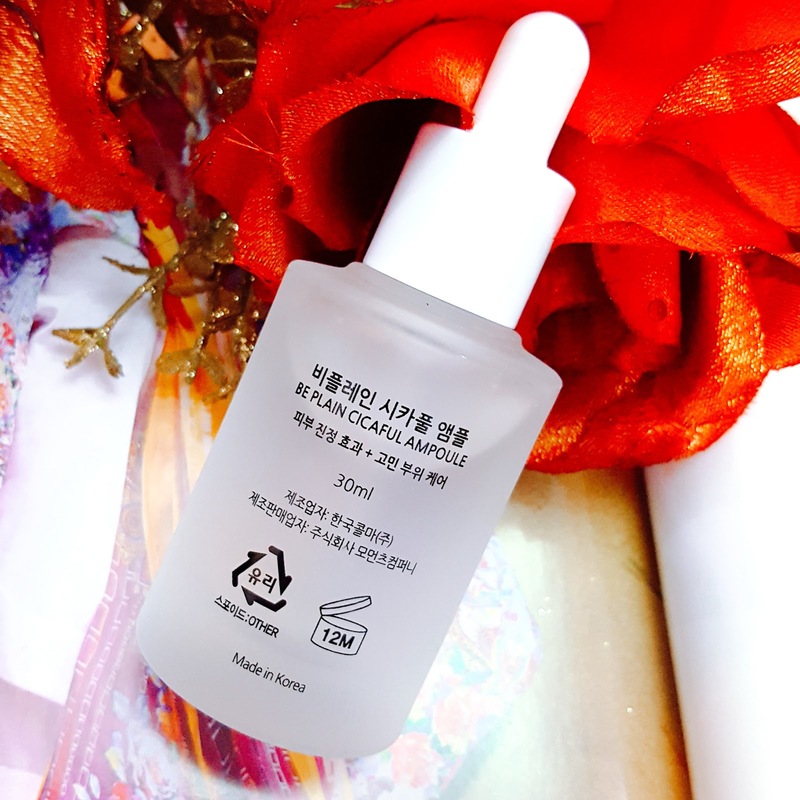 This ampoule really calms down my irritated skin and actually helps settle the redness down. 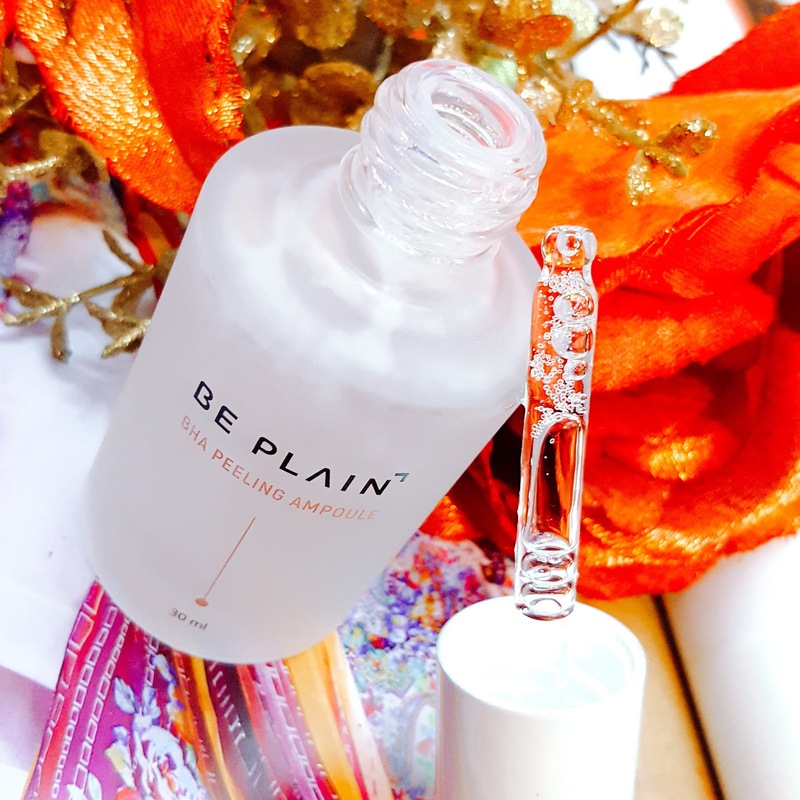 This ampoule also helps my skin stay smooth, hydrated and soft. 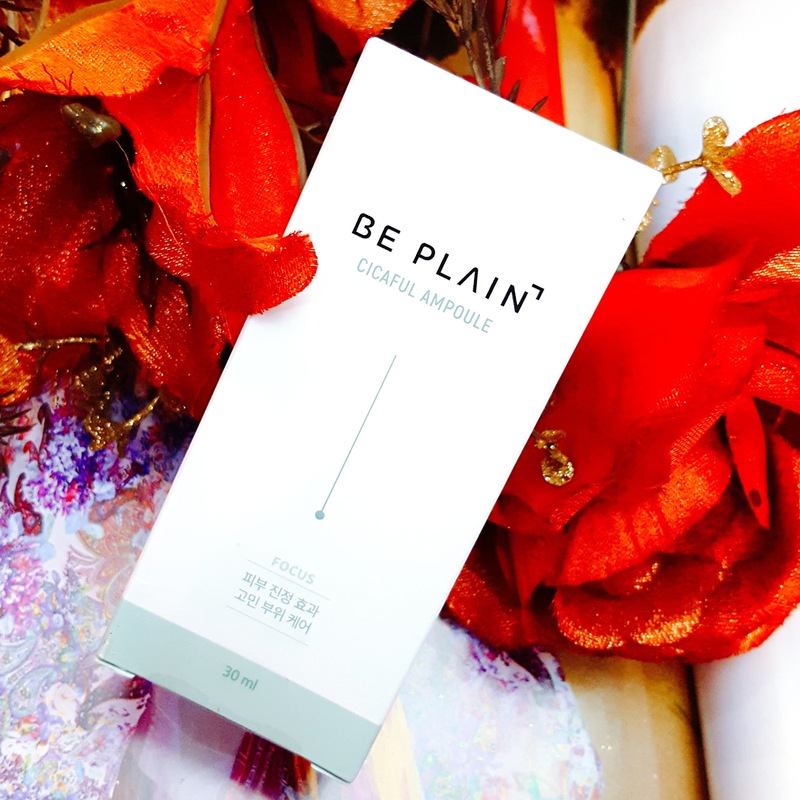 I find Be Plain's products effective and safe to use. I like how both these ampoules are super useful especially for people who have dry and acne prone skin. 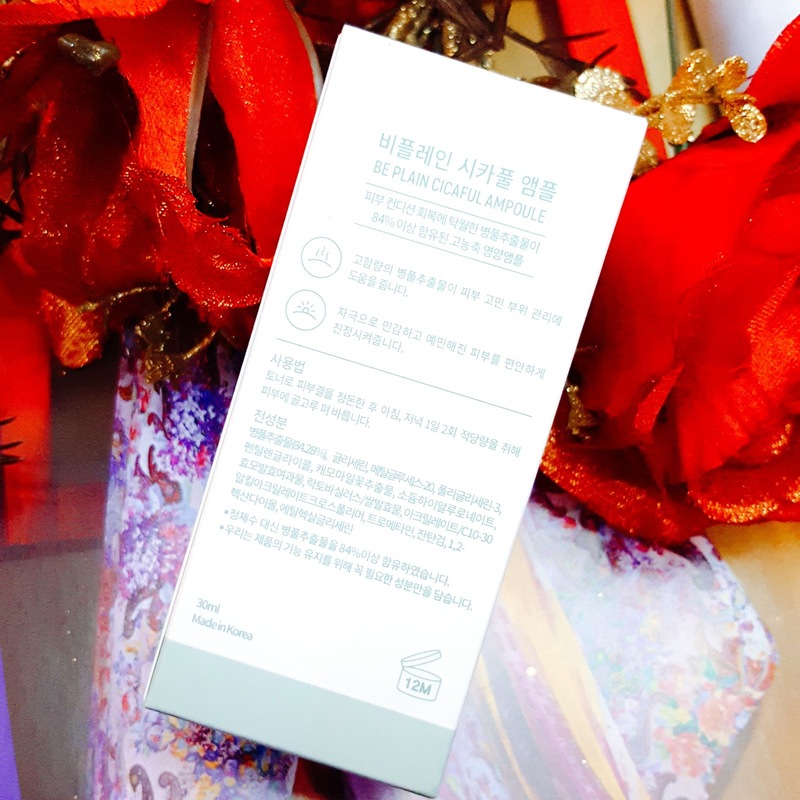 Among the two ampoules it is difficult for me to choose one as my favourite as both of these ampoules are helping my skin stay clear and smooth. Overall i am very impressed by this brand. This is all for today, i hope you find my review helpful. Thankyou for visiting.